WHITE STAR combines, modern styling, responsive performance and extraordinary luxurious accommodations. She differs dramatically from her sisterships featuring a highly customized Robin Rose interior using cherry joinery, custom onyx finishes and custom soft goods and wall covering throughout. Her four stateroom layout features a king-size master with his and her bath, newly designed and expanded VIP suite along with two guest staterooms all exquisitely finished and appointed. Her main salon and dining area are spacious with generous seating and large window provide panoramic views. The formal way and gourmet galley are separated to starboard by a custom swing-out art niche for privacy. To complete the main deck, her oversized aft deck features a fresco dining for twelve along with built-in wet bar with entertainment center to port. The enormous pilothouse provides generous seating, 270 degree visibility and state-of-the-art electronics along with a 42" hi-lo flat screen TV. Her flybridge features a custom hard top, bar, Jacuzzi, lounge seating and boat deck for water toys. 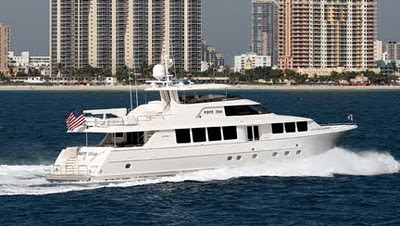 WHITE STAR is by far the most highly customized 112' Westport available!